In my essay, “Stairway to Heaven’s Metal” (City Weekly, Nov. 9), I reflected on my time as a Christian rock fan and concluded that even secular listeners can find something relatable in the music. It prompted an email from singer-songwriter Daniel Pimentel, who works in the youth ministry at K2 the Church. He included a link to his alt/indie rock band The Substant’s new album Orthodoxy. In fairness, Pimentel asked about the possibility of a review. He didn’t present his music as something a secular audience would enjoy, or even imply that they might enjoy the song on a non-theistic level. But that’s the extent of my interest in Christian music, of which “praise” or “worship” music is its most devout and literal subgenre. Even when a Christian rock band I enjoyed, like Petra, did an outright praise album, it rang sycophantic to me. That could be a symptom of how I came to my “faith,” which was through fear and pressure. But looking back at that time in my life, I realized that what I connected to in Christian rock was how a band articulated basic human struggle just as well as their secular contemporaries—and often rocked just as hard. I believed for the wrong reasons, but although it led to realizing I lacked faith, I didn’t come out of it empty-handed. That’s what I meant to convey in the essay, and it’s from this perspective that I relate to The Substant’s music. The full-on worship of Orthodoxy’s lead track, “Infinite” is too much, too soon, too on-the-nose, with a mantra-like chorus (“Oh, oh, my God/ you are infinite, infinite, infinite/ you are”) and 36 breathless intonations of the titular word. The beatific awe that Pimentel and backing vocalist Emily Sinclair attempt to convey eludes all but the converted. The song would certainly help the flock soar on mighty clouds of joy, happy to sing along. A secular crowd, however, is left scratching their heads on the tarmac. Looking at the titles of songs to come—“Sacred,” “Deliver Us,” “Love Remains,” “Agape,” “Victory,” “All I Need,” “The Lord’s Prayer”—I expected more of the same. But I kept listening. While the tracks aren’t as over-the-top as “Infinite,” they remain what they are: worship tunes, which are meant to be fawning. Even after repeated listens, the songs have little replay value for someone comfortable in his atheism. At best, I found myself thinking the music—which lands somewhere between Death Cab for Cutie and mainstream-successful Christian act Lifehouse—was decent, and would be decent with other lyrics. 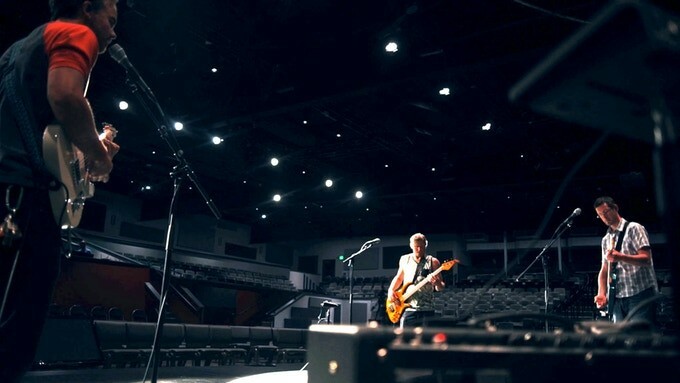 With worship music, your audience is an echo chamber. For that room, Orthodoxy is self-soothing and unchallenging. For non-believers, there are only so many ways to you can say "God is great" and, absent faith, they all have diminished returns. If you wanna make worship music, do it. If you’re writing for yourself and your peers, that’s great. If that’s also because you don’t wanna shove religion down unreceptive throats? Five stars, man. Sadly, I can’t relate—and am therefore not the right person to review your music. That said, if you ever find yourself writing songs—even Christian songs, that try to connect meaningfully with someone on the other side of the ideological fence—I’m all ears.